Pine needles range in size from 3 to 5 inches and are a deep forest green color. The long, thin needles vary slightly from variety to variety, depending on the region in which they grow. Pine needles have a strong pine scent, and a biting resinous flavor. In the wild Pine needles can be foraged year-round. 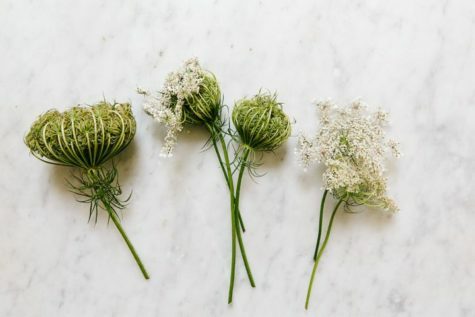 Foraged Pine needles can be used for a variety of applications. Pine needles are used most often for the oils and aroma within, to impart a pine scent or flavor to teas, ice creams, and liquors. Pine needles can be used like applewood or mahogany in fires to smoke meats or chicken, adding a hint of pine flavor. 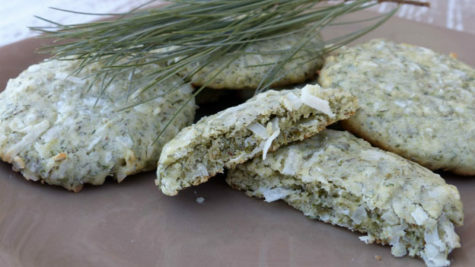 Place Pine needles under fish while cooking or chop like rosemary and add to marinades or brine. A variety of recipes can be found here. It is said that Pine needles can be used as a natural remedy for up to 80% of human diseases. Pine needles are high in vitamin C; a tea made with the needles of the Pine tree has been used to stave off scurvy when no other sources of vitamin C were readily available. 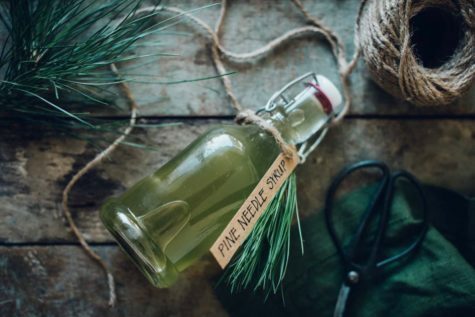 In a tincture or tea, Pine needles can help alleviate congestion and other respiratory problems. Components in Pine needles have decongestant, disinfectant and wound healing properties. Pine needles purportedly have three to five times more vitamin C than an orange, depending on what source you read, but there’s no hard and fast rule for how much C is in a pine needle. Regardless of the exact percentage, we know that pine needles and pine bark make an excellent natural vitamin C supplement. At least they’re potent enough to cure scurvy, a chronic condition caused by vitamin C deficiency that, left untreated, results in death. One historical account relates the 1536 story of French explorer Jacques Cartier, whose crew was cured of scurvy with a tea of pine needles and bark given to them by the Iroquois after the crew suffered months of nutritional deprivation at sea. Even though the crew boiled the decoction, which would have destroyed a significant portion of the vitamin C, there was still enough ascorbic acid and various amino acids to completely reverse their symptoms of scurvy. It was such a dramatic change, the tree used for tea became known as “tree of life”. There’s no way to determine exactly what species it was, but we know the tree of life was a conifer. 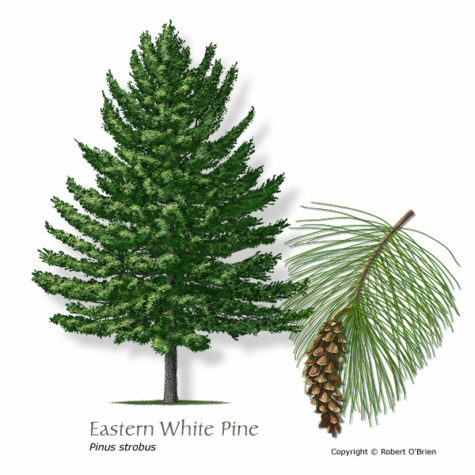 Eastern white pine is just one of the handful of candidates that could have been used. 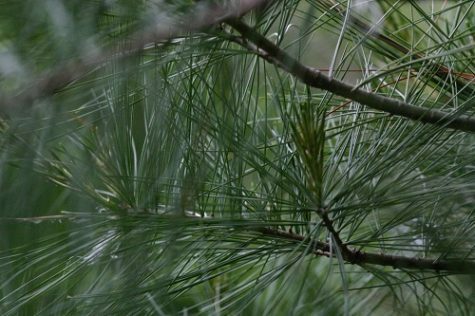 The ascorbic acid (vitamin C) content of pine needles seems to vary significantly depending mainly on the species of pine and the age of the needles. The Eastern white pine needles of this USDA Forest Service study had between 0.72 mg and 1.87 mg of ascorbic acid per gram of pine needles. New needles had the lower concentration, while 1 year old needles had 1.18 mg of vitamin C per gram of needles, and 2 year old needles had as much as 1.87 mg. According to the USDA, 100 g of orange has 53.2 mg of vitamin C, or .532 mg/g. That puts pine needles at slightly more vitamin C for new needles, twice as much for 1 year old needles, and 3.5 times as much vitamin C for 2 year old needles. The gist of the research is that ascorbic acid content increases with the age of the needles. 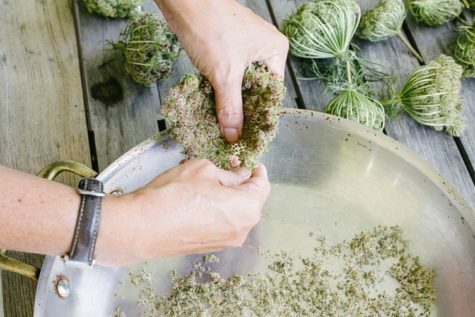 Does that mean older needles are best for pine needle tea? Not if you’re after taste. Older needles make a stronger, bitter, more piney tasting tea, so if you want a milder, more delicate tea, look for brighter green young pine needles. And don’t boil them. Boiling not only destroys vitamin C, but it also releases more terpenes–the organic compounds that make pine smell like pine–making more of a turpentine-like tea. Other research indicates that balsam fir needles have significantly more vitamin C than white pine, so species matters, and the bark of white pine has more than needles. If you want a more potent brew of vitamin C, throw in some pine bark, although I can’t vouch for flavor, since I’ve never tried it. 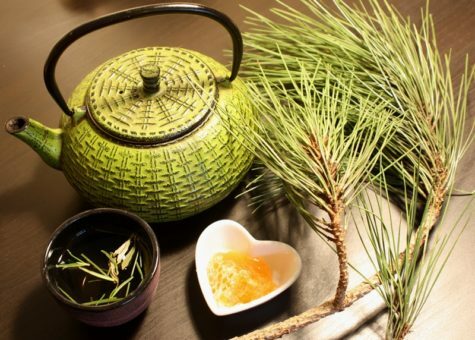 Although there are several species of pine that make suitable tea, Eastern white pine (Pinus strobus) is one of the trees more commonly associated with pine needle tea, probably for its superior flavor. Avoid pines that aren’t really pines. These include Yew pine (Podocarpus macrophylla) and Norfolk Island pine (Araucana heterophylla). And stay away from the highly toxic yew (genus Taxus). 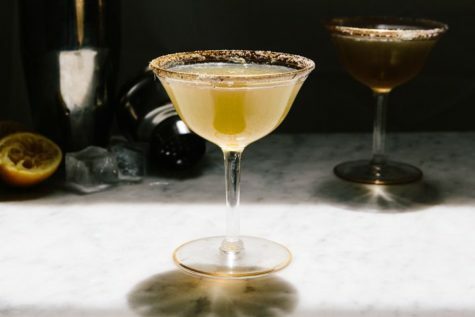 Most sources warn of the potential dangers of pines like Ponderosa pine (Pinus ponderosa) and Lodgepole Pine (Pinus contorta), citing the possibility of abortion from drinking tea made with these species. And some sources say all pines could potentially cause abortion. If you’re worried about it, stick with tried and true Eastern white pine, and of course exercise moderation. Pine needle tea has a pleasant taste and smell (always a good start). Vitamin C is also an immune system booster which means that pine needle tea can help to fight illness and infections. Pine needle tea also contains high levels of Vitamin A, which is good for your eyesight, improves hair and skin regeneration and improves red blood cell production. It can be used as an expectorant for coughs and to help relieve chest congestion; it is also good for sore throats. It brings you clarity and mental clearness. It can help with depression, obesity, allergies and high blood pressure. Pine needles contain antioxidants. These reduce free radicals, which are harmful to humans and can cause disease. Taoist priests drank pine needle tea as they believed it made them live longer. There is researched evidence that pine needle tea can help to slow the ageing process. Pick some pine needles and let them soak in boiling water on your stove and it will add a crisp pine smell all over the house. Perfect for Christmas. Bring water to a boil in a stainless steel pan. 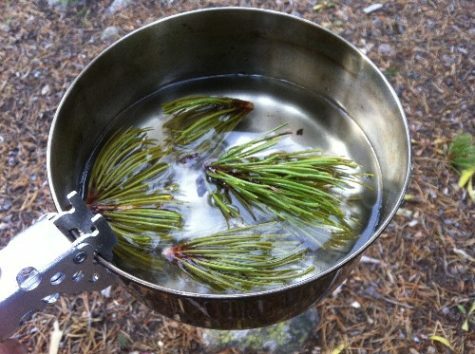 Add pine needles to water and reduce heat. Simmer for 20 minutes and remove from heat. Cover and let sit overnight or continue to next step and serve. Strain out pine needles, sweeten to taste, and serve tea hot or cold. 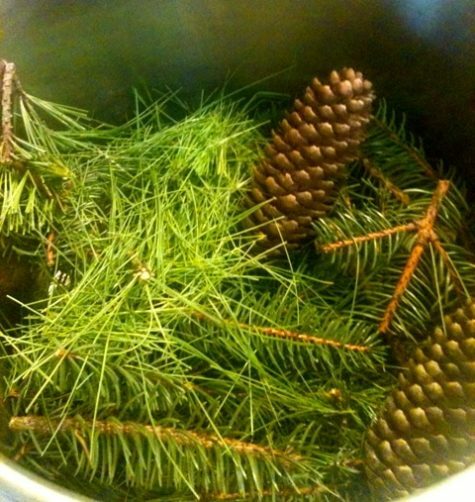 Make sure not to boil the pine needles in order to preserve the vitamin C and prevent the release of bitter terpenes. Vitamin C doesn’t last long, so drink this tea as soon as possible. Enjoy your tea. 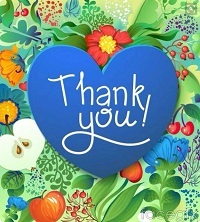 Who knows, you might live to be 103 with 20:20 vision, a mind as sharp as a pine needle and no varicose veins. We’ll drink to that! Firstly, don’t try pine needle tea if you are pregnant. Secondly, most pine varieties can be used, but steer clear of Yew and Cypress which can sometimes be mistaken for pine. A good rule of thumb is to avoid flat needles. If in doubt, ask a Forest Ranger. Spruce tip syrup used to be quite popular back in the day. It was used throughout Europe and by the pioneers in North America. Since Spruce tips grow in the spring, this syrup would have been a seasonal type of medicine. I generally make my evergreen syrup using needles and cones as these parts of the plant are most readily available, and have medicinal value as well. Energetically, evergreens are super appropriate to use as medicine throughout the winter. Although most of the trees have lost their leaves by now, evergreens remain green, showing us that nature lives all year long. 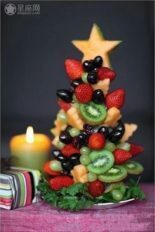 Evergreens are also helpful with the particular ailments that abound during the cold and dark season. For the following recipe, I harvested from Norway spruce (Picea abies) and White pine (Pinus alba). Not the time of year for the tips so I used needles, twigs, cones. It turned out quite delightful with a predominantly sweet taste and evergreen-almost citrus undertones. The weights are listed because I had them handy, however there is no set amount – it all depends on how much syrup you want to make. 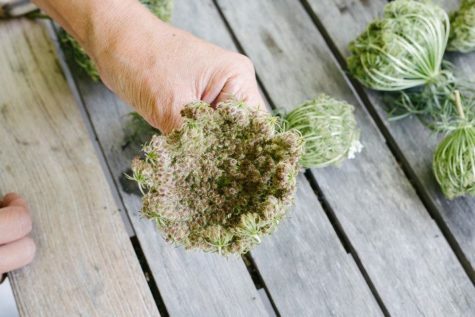 Put the plant material in a pot and cover with water. Bring this to a boil and then lower to simmer until the liquid is halved. I used a spoon as a measuring stick. You can also have a measuring cup handy to pour the liquid back and forth until it measures half of water added. Reducing the decoction to half of the original liquid took almost ten hours. The liquid is then strained out, put back in the pot without the needles, and then the honey is added. The amount of honey to add is equal to half the amount of concentrate, so 8 ounces of concentrate would require 4 ounces of honey, or a 2:1 ratio. Warm and stir the mixture, and the syrup is done! Tree medicine is very powerful when grounding is needed. It fosters opening up to old wisdom, and letting oneself be cared for by the Earth. The evergreen forest is quiet, and feels limitless and mysterious. Evergreen syrup is good medicine for reflecting, meditating, and otherwise conjuring up introspective energy. Decomposition of evergreen needles lowers the surrounding soil pH to provide a particularly acidic environment, a fact that I find interesting and relevant to its use as an antiseptic. In Europe, pine products have been used as medicine since the Middle Ages, and their medicinal properties are pretty uniform across the Pinus genus. 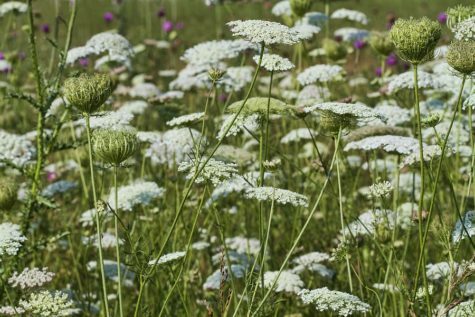 It acts as a stimulating antiseptic for respiratory infections and stuck mucus, and is useful for bronchitis, and at onset of colds and flu to stop infection. Pine is also used for coughs and asthma. 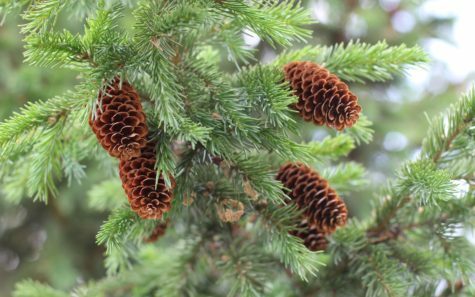 Spruce is useful to cut phlegm in the throat and lungs, and for opening air passages. It is high in vitamin C content, and can also be helpful for bladder conditions and in cases of leucorrhea. 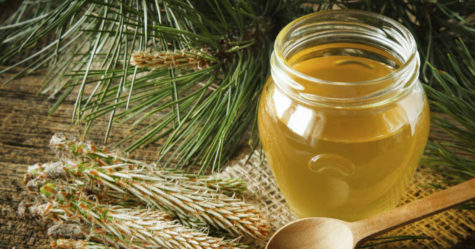 Overall, Spruce and Pine syrup is great medicine to have on hand during the winter and early spring season. 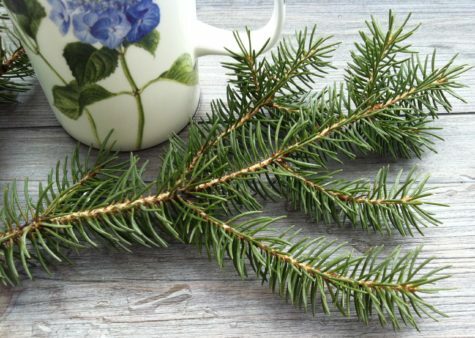 It can be used for acute illness, and as a winter tonic to provide a bit of sunshine in the form of a local source of vitamin C.
Evergreen syrup is also really tasty, making it an easy medicine to work with as it can be added to hot water, porridge, pancakes, or taken straight. Boreal forest meets tropical fruit in a shortbread cookie. Place all dry ingredients into a bowl. In another bowl blend together melted butter, eggs, and vanilla. Mix the wet ingredients into the dry ingredients and blend well. Roll cookie dough into balls about 3/4 the size of a golf ball and place on ungreased cookie sheet. Use a fork to flatten the cookies until they are about 1/4” thick. Bake at 350°F for about 10-12 minutes. Makes about 5-6 dozen. 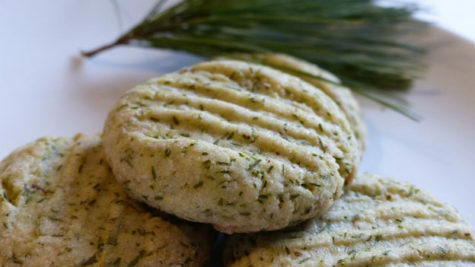 Pine needle cookies that taste great. 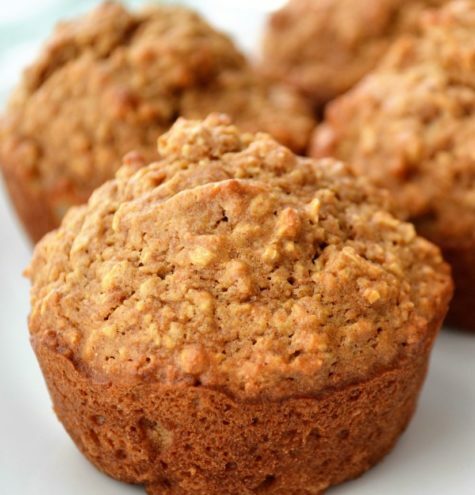 No pine nuts are used in this recipe. Place all dry ingredients into a bowl. In another bowl blend together melted butter, eggs, and vanilla. Combine the wet ingredients into the dry ingredients and blend well. Bake at 325°F for about 10-12 minutes.